I think this principle is the most difficult of all three principles because it means that the holistic nutritionist and teacher has to demonstrate their integrity at all times and to ”practice what we teach”. However, even the practitioner has their own cross to bear and their own journey to walk. This journey may still be in progress while working with clients. When we are experiencing our own transition to wellness, we may still have one foot in the old patterns and one foot in the new and this makes it difficult to be a “perfect” example. 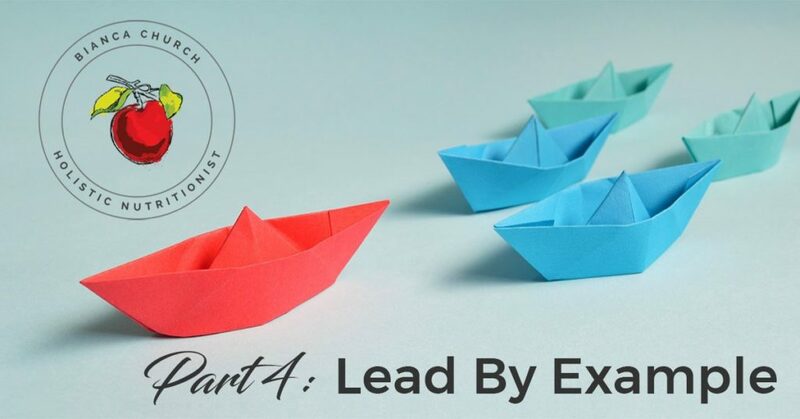 Fortunately, leading by example does not mean you have to be perfect. It just means that you must demonstrate the qualities of accountability you expect from your client because if you do not, your clients will know, even if only intuitively. It also means you must go ahead into unknown territory and be the explorer. You will be the one who will have to go first and stay open to innovative nutrition ideas and therapies and analyze new research. However, you must expect your prospective clients, your friends, your family, your peers, and the public to be watching you. It can be something you may never even hear or know of: “Hey, there’s that new Holistic Nutritionist I was telling you about, lets see what she puts in her grocery cart” or “What is he doing at a coffee shop?”, or “How come its OK for her to be eating ice cream”? The public will be looking for the slightest imbalance between what you say and what you do. The reason the holistic nutritionist must be the picture of health and wellness is because you are the billboard for holistic nutrition and if not you then who will be? If you can’t live your truth, then why should your client? Many clients are new to holistic nutrition and they need us to set the example first, just as many explorers had to go first. What does this mean to you? It means represent your profession well. I am not saying that you must be a purest and never stray. That is not human. We were designed to be fallible and you should embrace this human quality with love and acceptance, but this is why I believe in the 80 – 20 rule with regards to our dietary and lifestyle choices. It also means, if you have your own work to do, make yourself one of your first projects and don’t keep your project a secret – let those around you see that even you have to embrace the process to wellness. This way you can truly lead by example and be a convincing representative of holistic nutrition and the holistic health model. Being a Catalyst for Change will be challenging but it will also be exciting and awe inspiring. You will make a difference in people’s lives and you will have a hand in changing this planet’s view of health and disease. Just remember to measure your successes not by your income, but by the number of empowered and self responsible clients you help to create. In a sense, your success should be measured by the number of clients who no longer need you. Imagine this world if everyone took responsibility for their own health and wellness and imagine yourself facilitating this change. This is what it means to be a Holistic Nutritionist and a catalyst for change. And remember to stand in your truth.